Löwenhardt! 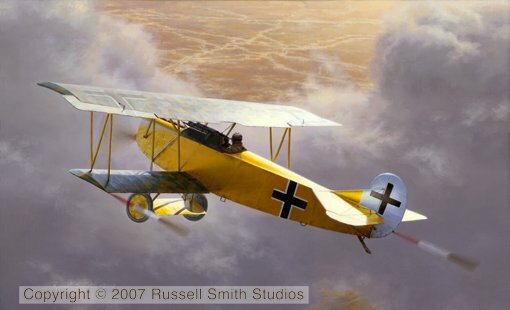 features the legendary yellow Fokker DVII of Oberleutnant Erich Löwenhardt, Germany's 3rd ranking ace of WW1, behind only Manfred von Richthofen and Ernst Udet. Löwenhardt was an aggressive, skilled fighter whose score grew steadily. At the end of May 1918 he received Germany's highest honor, the Pour le Mérite (Blue Max) after 24 kills. Flying the new Fokker D.VII, he added eight more in June and no fewer than 16 in July. His tally climbed to 53 on August 9. After scoring his 54th victory, he collided with Leutnant Alfred Wenz of Jasta 11. Both men jumped from their planes but Löwenhardt was killed when his parachute failed to open and he fell to his death from 12,000 feet.